We already posted the kickstarter video which breaks down the basic functions, so I won't bother rehashing those. The unit looked great, and everyone I dragged to their booth agreed. The best part of this controller is the veritable unending amount of control you can add to a very simplistic setup. 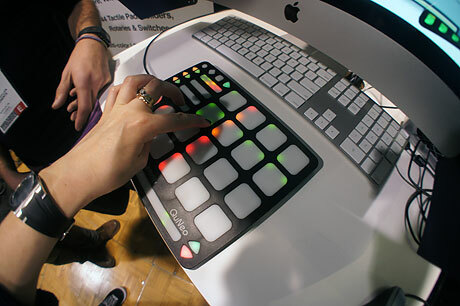 The touch pads can be used as almost anything from a drum controller to a step sequencer, to a 8x8 trigger controller to individual x/y pads. The LEDs were bright and clear, though the standard Red/Green/Yellow did seem a little toy-like. My hope is they add some finer LED control for purples and blues. Obviously this isn't a lot of new information, but it was really great to get our hands on the unit and get a chance to play with it. They will be releasing the ability to remap the unit for nuanced, individual control, and will be providing communities to share said mappings. Keith McMillan has some interesting controllers! 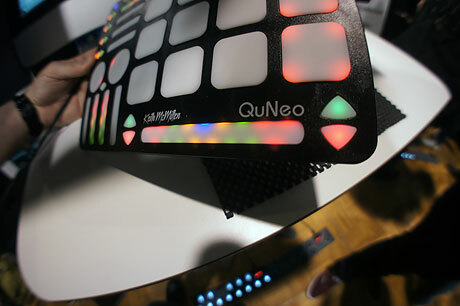 I hope in the future I can still get my bundle of controllers from them, including a QUNEO! For me this is the most exciting new controller in class for a while, that said it's kind of created it's own class! Fair point about the colouring, it would be nice to see a scheme that tied more in to it's futuristic aesthetics and break away from the tired Novation esq colour standard, a bit of purple, blue and maybe pink would certainly make it look more tech and valuable. Until Traktor 2.5 comes along, I personally have little need for one of these, with all the colours it could maybe serve as a good alternative to the F1? The QuNeo doesn't really fit in to my current set up but with the all technology that has been developed in to this controller, I to will be hoping for something with a bit more of a conventional layout. Also loving the kick start thing, a scheme so good it almost nearly had me buying a controller that I knew I didn't need. Quite interesting approach, but I have to see how it will fit with existing software.